You’ll remember from my last post that I had been cheating on my wife and the affair had come to light. Everything was broken in my life at that point. My marriage, my business, my body was even overweight and beaten down. I was drinking a ton and considering suicide to fix my problems. And then, at the very bottom of my personal well, a light shown in. I wish I had immediately changed everything. I really wish I could say the cliche “happily ever after” line here but that just isn’t how it went. Ruth and I started attending Celebrate Recovery every week and I was seeing my counselor every week too. We were also invited to go to Grace Community Church by some friends on Christmas Eve. I was so broken and defeated that I would try anything to change my situation. I was terrified that I would lose my wife and boys, not to mention my business. I remember feeling this tiny, almost imperceptible spark of hope as I began to ask God for help. It was so small that I almost missed it. I almost just went through the motions like I had with so much in my life up to this point. But there was something there, something real and hopeful. So I continued to go to meetings and counseling sessions. I even gave up ride days to go to church again. I had grown up in church back in Oklahoma. My mom’s dad was the head pastor at a big, beautiful Episcopalian church that was just a block from my house. I attended YoungLife in high school and had given my life to Jesus as a young boy. I had every positive example in my life and I had still turned so far away from faith and God. I am the perfect example of how to screw it all up, even when you have every advantage. I wanted everything to be fixed right away. I wanted to say a prayer and wake up the next morning with a smile on my face, a hug from my wife and tons of money back in my bank account. Surprise, freaking surprise Morgan, that didn’t happen. In fact, when I woke up every morning I still felt terrible, I was still emotionally distant and I was still BROKE! But something made me try, something made me get up every day and pray again. As that winter ended and spring began I got busy again. The shop picked back up and work rolled in. Bikes needed to be fixed and tires needed to be changed so I just got up and went to work. My shop became my safe place every day. Home was a disaster and I still felt super uncomfortable at church and in CR meetings but no matter how I felt, motorcycles kept calling me in every day. Highland Cycles was like a bomb shelter. Shrapnel from my bad decisions was flying around, still tearing into every part of my life, but I could close the door behind me and be safe with my motorbikes. Some of the most amazing things happened in that shop over the next few months and years. Miracles happened and continue to happen over and over. I was completely out of any extra money or credit and there were days and weeks that I didn’t know whether or not I would be able to keep the lights on. I remember having all of my bills due and having no money to pay them and crying at night at home wondering what I was going to do. I was arguing with Ruth that I should just shut it all down and quit but she wouldn’t let me. In no uncertain terms, she told me to get my S&#T together and quit being a baby. I got back up the next morning and went to work and by God’s grace some customers came in and pre-paid for a ton of work. Their money paid my bills and kept the doors open another month. I couldn’t believe it!! Motorcycles had been a big part of some really bad decisions and the shop hadn’t been the most well thought out plan. Even my affair had centered around motorcycles and the shop. You could argue that at one point they were going to be my undoing but here in the midst of the worst, most ugly part of my life, they were saving it. There were days, weeks and months where motorcycles were the only reason I got out of bed. They were the cause of many prayers and the answer to many of them too! Thanks for tagging along again through my mess. We are starting to climb out of the pit but don’t worry, this isn’t going to end anytime soon. There are plenty more mistakes, miracles and mishaps coming. 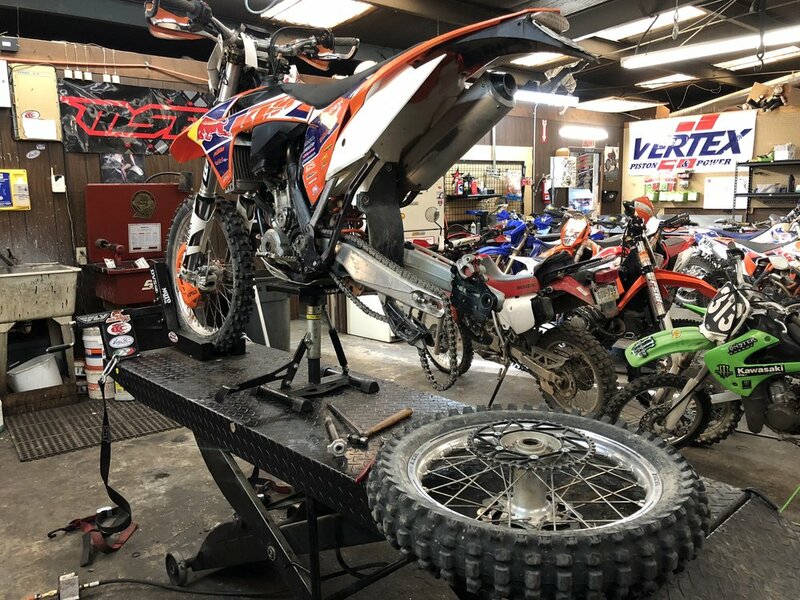 One thing I have learned is that it takes a very long time and a TON of work to repair a broken life but, like fixing a bike, it is worth the effort! If you don't want to miss any of my bad decisions, please click the button below. I promise I won't spam you!